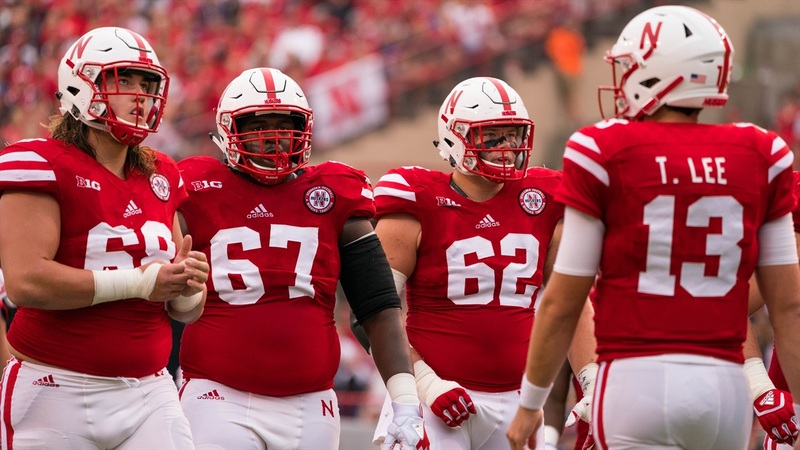 There’s only one unit on the offensive side of the ball left to preview for the Huskers and it’s the one that might be the key to the whole thing: the offensive line. Like almost every other unit, the line struggled mightily last season, but it might not have been quite the total failure some have painted it out to be. A dive into the numbers shows both positives and negatives, and perhaps an offseason under Zach Duval and Greg Austin could tip the scales more to the positive side in 2018. Opportunity rate is a measure of how often the offensive line does its job in the run game. In this case, the job is opening up at least five yards of running room. The Nebraska offensive line only did that about a third of the time last season, which has them down at 112th in the country. Nebraska rarely won in the trenches last season, and even when they did block well they rarely finishes those blocks. The result was a lot of short runs. Devine Ozigbo, who led the Huskers with 129 rushes, only averaged 3.8 yards per attempt. Mikale Wilbon was a little better at 4.3 yards per attempt on 88 carries. Jaylin Bradley only ran the ball 24 times but didn’t do much with them at 3.88 yards per carry. The individual opportunity rates for each of those three were 31 percent, 29.5 percent and 25 percent. For whatever reason, Nebraska blocked a lot better for Tre Bryant than any of the other backs that had to step up when he went down. Bryant’s opportunity rate was 49 percent and his average per carry was 5.9 yards. Central Florida’s overall opportunity rate was 41 percent, ranked 34th. However, that was buoyed by good rates for the quarterbacks and the back-up running backs who got fewer carries. Central Florida’s top three rushers outside of McKenzie Milton were Adrian Kills, Otis Anderson and Taj McGowan and their opportunity rates were 37.1 percent, 34.3 percent and 29 percent. The difference was Killins and Anderson were phenomenal at creating their own yards and none of Nebraska’s backs from last season proved capable of that on a consistent basis. Perhaps Greg Bell, Maurice Washington and Miles Jones will prove to be just as dynamic as Kills and Anderson, but counting on that might be expecting a bit too much. Nebraska needs to give its backs a better chance to succeed, and that starts with winning in the trenches. This may come as a shock to some, but Nebraska’s offensive line wasn’t actually complete garbage in pass protection last year. The Huskers gave up 24 sacks in 2017, which was just inside the top half in the Big Ten. When you adjust for how often Nebraska dropped back to pass under Mike Riley and the strength of the pass rushes they faced last season, the offense’s sack rate was one of the best in college football at 200.2. That was good for eighth in the country, one spot ahead of Central Florida at 197.8. Granted, that rate only includes sacks, not heavy pressure that results in off-target or tipped passes. Fans saw plenty of those from Tanner Lee last season. However, considering his NFL preseason debut with the Jacksonville Jaguars resulted in four completions and five sacks, maybe Nebraska’s line wasn’t actually that bad? The Huskers will return five linemen who started at least four games last season and four of those starters have put on about 20 pounds of good weight apiece (Cole Conrad is still listed at his weight from last season, 300 pounds). Brenden Jaimes and Matt Farniok are sophomores now and natural improvement could be expected from that pair while Foster, Farmer and Conrad have considerable experience under their belts at this point. Couple the success the linemen had protecting the passer in last year’s system with Scott Frost’s offense that puts a premium on quicker passes and perhaps the offensive line could be a surprising strength under Greg Austin. However, for that to happen, the linemen have to be ready to keep up with Nebraska’s preferred pace, something that won’t be easy for men weighing more than 300 pounds.